The power company Northern Ireland Electricity said 15,000 households in the province should prepare to spend Monday night without power. Police in Scotland say the storm has hit Dumfries and Galloway and it is forecast to continue over the region into the evening. And in Cumbria, police in Barrow closed roads around Barrow AFC's stadium after wind damaged its roof. Cumbria Police said it was dealing with "numerous incidents" related to the high winds, which reached up to 70mph in the area. The force had received reports of roofs and debris on the roads and overhead cables which had come down and it was urging people to only make essential travel. In Wales, roads and railway lines have been closed and a gust of 90mph was recorded in Aberdaron, Gwynedd. The Welsh Ambulance service said a woman has been injured after being hit by a falling branch in Wrexham. In Ireland, the woman, in her 50s, died near Aglish, County Waterford, and a female passenger, in her 70s, was injured. Her injuries were not believed to be life-threatening, the Gardai, Ireland's police force, said. One of the men died near Dundalk, Co Louth, after his car was struck by a tree at about 14:45 BST, the Gardai said. The other man, in his 30s, was killed in Cahir, Co Tipperary. All road users were urged to stay indoors and not travel unless their journey was absolutely necessary. Flights were also disrupted as several UK planes were forced to land or divert after reports of a "smoke smell" linked to weather conditions. BBC Weather said the strongest winds recorded so far were at Roches Point, near Cork in the Republic of Ireland, where they reached 97mph. 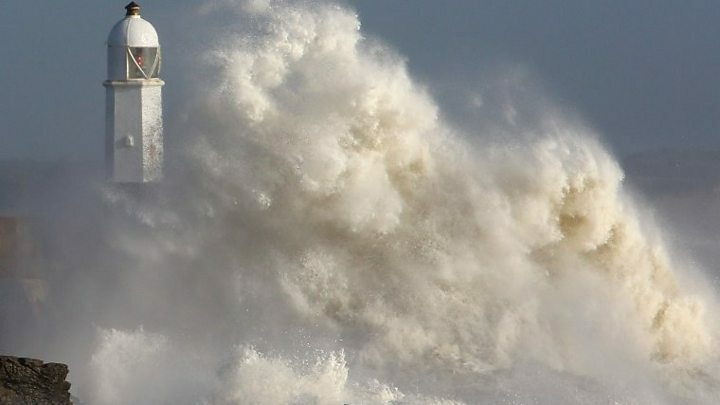 Ireland's meteorological service said its highest gust was 109mph at Fastnet Rock. The Met Office's amber warning for Northern Ireland, western Wales and western parts of Scotland is still in force for wind. Forecasters are predicting that the far south-west of Scotland will see winds of 80mph on Monday evening, followed by 60mph gusts over Glasgow and the central belt in the early hours of Tuesday morning. The main danger facing Scottish commuters in the morning would be debris on roads, they said. Other parts of the UK have seen unseasonably warm temperatures. And skies have turned red and yellow as Ophelia drags dust from the Sahara through the atmosphere. It could be several days before power is restored to some homes in the Republic of Ireland, ESB Networks has warned. The roof of Cork's football stadium has also been blown off by the winds. Ophelia has arrived from the Azores in the Atlantic Ocean and coincides with the 30th anniversary of the UK's Great Storm of 1987. 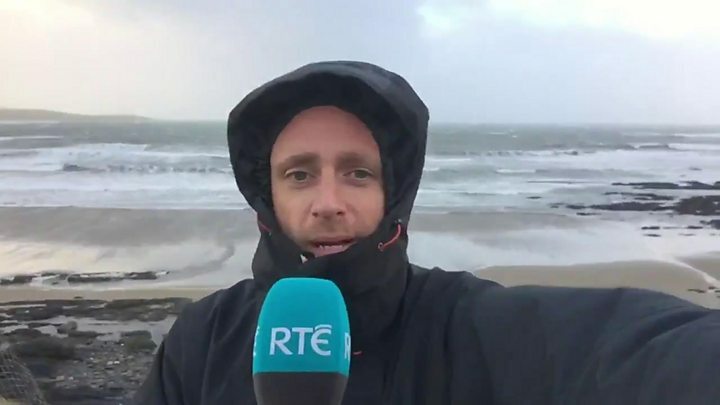 BBC Ireland correspondent Chris Page said it would be the most severe storm to hit Ireland in half a century. The Irish Republic's Met Eireann said the storm was forecast to continue travelling north over western parts of Ireland, with "violent and destructive gusts" of 75mph to 93mph expected countrywide. It also warned of possible flooding due to heavy rain and storm surges. "There is a danger to life and property," it said. It has issued a red alert for the country. In England, three flood warnings - meaning flooding is expected - have been issued in the South West, and there are several flood alerts - meaning flooding is possible - across other parts of the country. The Scottish Environment Protection Agency has put a series of flood alerts and warnings in place for south-west Scotland.